Join Gloria and her family for a Good Old Fashioned Backyard BBQ in her own backyard! Saturday, March 26th, 12:30-5:30 p.m.
Entertainment provided by Mr. Wonderful DJ and a Special Appearance by Rene & Rene at 4p.m.!!! 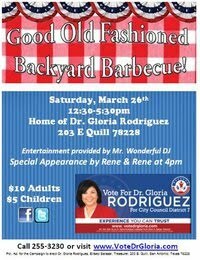 Tickets can be purchased by calling 210-255-3230 or emailing info@votedrgloria.com.